Shortly before Thanksgiving, I got a message from an innkeeper who had just discovered that we offered a holiday decorating service. 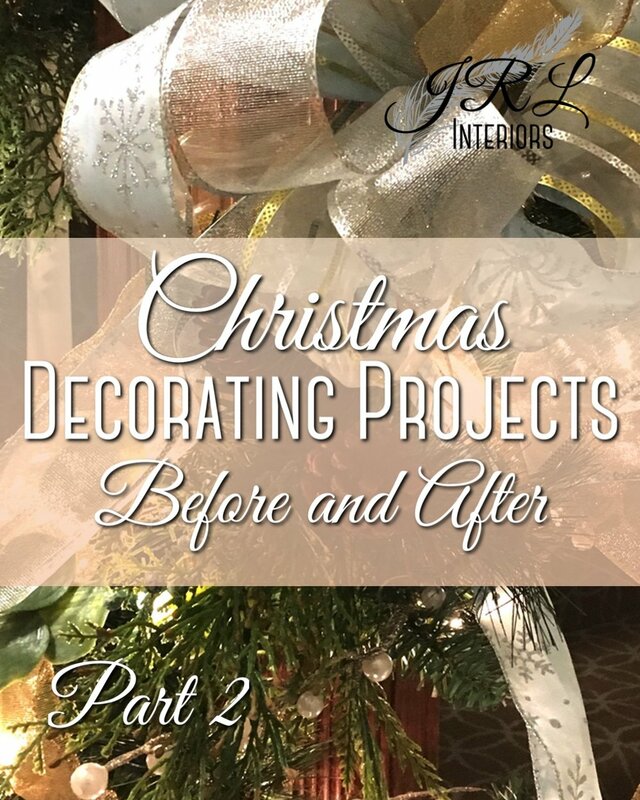 She was wondering if it was too late to hire us for an installation that needed to be done the week after Thanksgiving in order to be ready for the local Christmas Prelude celebrations which include tours of the historic inns…including hers. We were able, with some juggling, to squeeze in a site assessment visit, a couple days of shopping and her installation just in the nick of time! Her inn is the lovely Inn at English Meadows in Kennebunkport, Maine and is definitely worth a visit! The inn itself is historic, but the buildings have all been updated in a clean, new-traditional style. This was her first Christmas Prelude as an innkeeper and she wanted it to be special. Since we were on a tight timeline, she sent us some pictures ahead so we could start thinking about options and work out a budget. Below are shots of the spaces to be decorated. She also already owned some very pretty silver and gold decorations from her previous home and had begun collecting some mercury glass and aqua ornaments in anticipation of decorating the inn. Below are pictures from our assessment visit of some of the available decorations. Mercury glass and aqua and gold and silver balls and pretty snowflake ornaments would all end up on the tree and as shelf styling elements, a mercury glass tree (and a couple of potted candles not pictured) sparked the idea for a winter wonderland of silver and white for a table vignette in the dining room, and the pearl and gold garland would wind up as embellishment for the stair garland in the foyer. She also had window candles and ordered a tree for the living room….which is another story, but suffice to say they delivered one and it got decorated! We wanted to keep the tranquil feel of the inn while adding some of the warmth and charm that reflected the personality and aesthetic of the innkeeper. For this project, we chose a winter white and silver palette with accents of gold and pale to peacock blue to highlight the color scheme of the furnishings. We planned a flow throughout 3 adjacent spaces with a more pastel aqua with silver and gold in the foyer, a striking peacock accent with silver, gold, and white in the living room, and an ethereal wintery silver and white with hints of gold in the dining spaces. 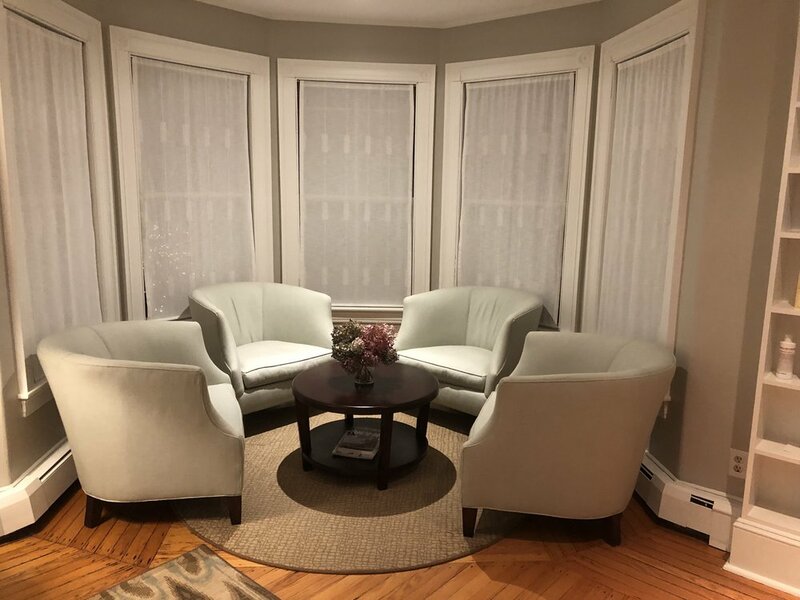 The window treatments were not operable so we suggested tying them up partway to A. take advantage of the views and B. allow the addition of candles to the windows. We also suggested white for the poinsettias being ordered to best blend with the color story of the Christmas decor. 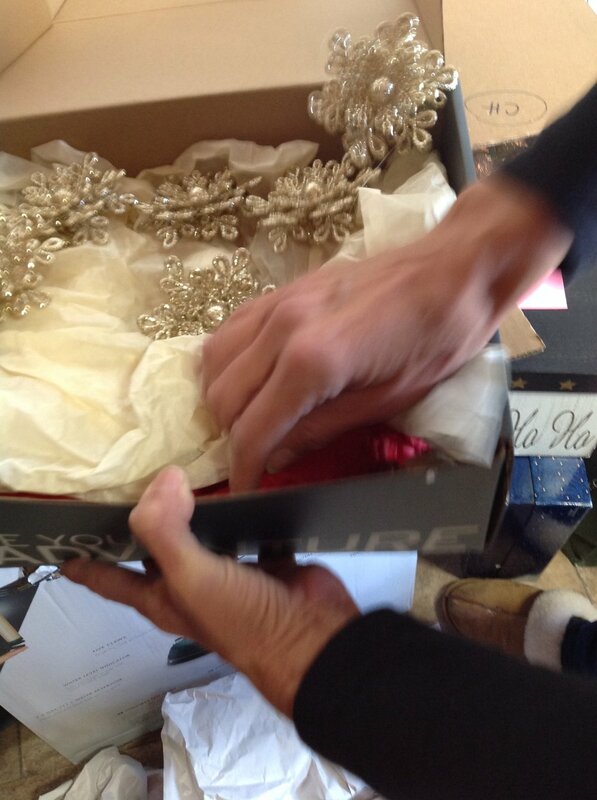 Here are a few shots of the action on installation day…it always gets much worse before it gets better! We arrived with a car packed to the gills with greenery, ribbon, and accessories. Installation took our team about 7 hours. Load-in and the unwrapping begins! The foyer welcomes guests with a beautiful lighted stair garland of mixed greens intertwined with the client’s delicate pearl and gold garland and topped with yards of four different ribbons fashioned into lavish bows and artfully tucked into the garland. The foyer dresser, which usually displays guest literature, was cleared to make way for a collection of pastel carved trees and a nutcracker watching over jars filled with silver and gold candies. The living room furniture was rearranged to accommodate a beautiful Christmas tree in the round turret featuring a striking peacock ribbon along with gold, silver, aqua glass, and peacock ornaments and white berry, glittered cedar, and silver ivy branches. Coordinating ribbons and decorations embellish a wreath over the cozy fireplace. Shelves surrounding the fireplace were styled with the client’s books, candleholders, ornaments, and decorative boxes. The coffee table was styled simply with a beautiful aqua platter filled with candles and greens. The main dining room features a 4 window bay which we swagged with evergreen garland and ribbons and added a large coordinating wreath to the center. The main dining table was treated to a tablescape with a family of white deer amid mercury glass candleholders and trees. The second dining room’s archways were swagged with evergreen garlands and white grapevine and topped with ethereal sheer silver and gold bows. Our client was beyond thrilled with the results and the rave reviews from her staff, guests and visitors! Christmas Prelude festivities wrap up December 9th, so if you get a chance to head up to Kennebunkport, be sure to check out the Inn at English Meadows! For tips on how to decorate YOUR home for the holidays like a pro, click HERE﻿. If you would like to hire our professional Holiday Decorating Services to get your home or business ready for the party season next year, please book by September!